USS West Virginia (BB-48), a Colorado-class battleship, was the second United States Navy ship named in honour of the country’s 35th state. She was laid down on 12 April 1920, at Newport News, Virginia, launched on 19 November 1921, and commissioned on 1 December 1923. Her first captain was Thomas J. Senn. After her shakedown and crew training was finished, she was overhauled at Hampton Roads, and later ran aground in Lynnhaven Channel. After her repairs she participated in exercises and engineering and gunnery courses, winning four medals in the latter. She participated in other fleet tactical development operations until 1939. In 1940, she was transferred to Pearl Harbor, to guard against potential Japanese attack, and was sunk by six torpedoes and two bombs during the attack on Pearl Harbor. On 17 May 1942, she was salvaged from the seabed by draining the water from her hull. After repairs in Pearl Harbor, she sailed to the Puget Sound Navy Yard. There she received an extensive refit, including the replacement of her 5-inch (127 mm)/25 calibre anti-aircraft guns and single-purpose 5-inch/51 calibre guns with dual-purpose 5-inch/38 calibre anti-aircraft guns. She left Puget Sound in July 1944, for Leyte Gulf. She bombarded Leyte in November 1944, becoming part of a successful American plan to destroy the portion of the Japanese fleet trying to sail through the Surigao Strait, and later attacked Iwo Jima and Okinawa. At the end of the Pacific War, she entered Tokyo Bay, for the Japanese surrender, and became part of Operation Magic Carpet, making three runs to Hawaii to transport veterans home. She was deactivated on 9 January 1947, and laid up at Bremerton, Washington, until sold for scrap on 24 August 1959. 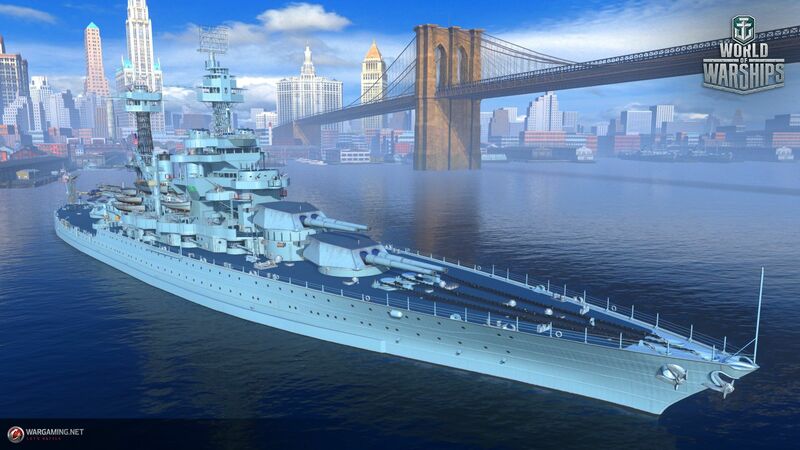 Introduced as a Tier VI Premium battleship, players will be able to see it in the game soon once Supertest starts. More details as soon as they become available. Many players are strongly opposed to this ship coming as a tier 6. Many people are against this ship going in as a tier 6.